working with pen and ink, watercolors, and acrylics. His love for history has led him to create models and historical figures, but he also has been fascinated by architectural structures and various forms of brick laying. His Old English Cottages, which form his Frogmorton Village, are made of real brick and other natural materials. You can view more of his works of art by visiting his web site at Frog Morton Studios. Since Rik specializes in creating fantasy cottages drastic transformations, such as the one called for in this project, are not new to him. "Reality is a great place to visit ... but who would want to live there?" That is one of Rik's mottos and, I suspect, one of the things that keeps such a creative imagination young and overflowing with marvelous ideas. 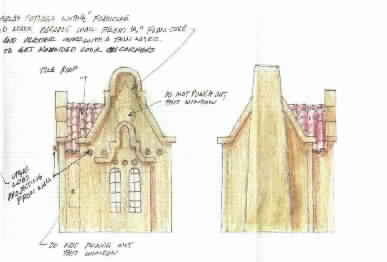 Rik''s design will make it possible for a Victorian style Cottage to turn into a Spanish style house, very much like a caterpillar turns into a butterfly. I don't mean to imply that the Buttercup does not have a lovely design, but rather that the transformation will be just as dramatic. With the design changes he has dreamed up, my Spanish bakery will not easily betray its origins! Rik's handwritten notes highlight the changes that are needed for the transformation. 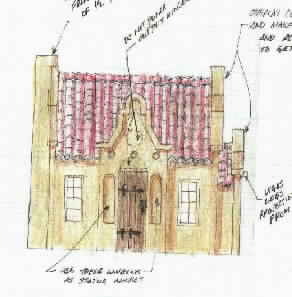 This front views shows changes to the facade, the front door. windows, as well as the addition of red Spanish tiles on the roof. Design by Rik Pierce. Rik's design calls for some important structural changes in the Buttercup. As he noted in the notes that he made on the sketches, the transformation requires the use of 1/2" thick foamcore board (or two 1/4" thick boards glued together), since a whole new facade must be created. Even thicker walls are required for building the horno (fireplace) and the chimney -- two 1/2" thick foamcore boards glue together are used for this addition. View of both sides of the house. The one on the left is the side with the bay window and the changes to the facade. The view on the right shows the fireplace and the chimney addition (side window will be eliminated). Design by Rik Pierce. A total redesign of the front door, leaving out the arch in the original door. The door is made out of wooden planks, rather than one solid piece of wood. Cast iron hardware will be added. The two side windows that were flanking the front door will become nichos for statues. The other two windows on the side of the entrance area, and all the round windows in the original design will be eliminated as well. All the windows will have a simpler design and will be set inside the thicker walls, with no outside trim. The horno (fireplace and chimney) will extend outside the house. Both exterior and interior walls will be plastered. In typical Southwestern style, round vigas will be added, extending through the exterior walls.